Thanks to Sr. Ellie Finlay of St. John's Center for Spiritual Formation I found this interesting article on the role of meditation in mental health. "Clinicians are increasingly looking for effective, preventative, non-pharmacological options to treat mental illness. 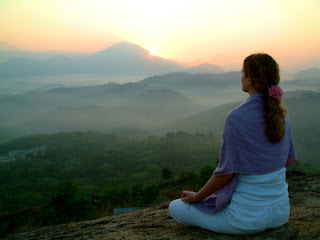 And meditation techniques – such as quietening the mind, understanding the self and exercising control – show promise as an alternative tool to regulate emotions, mood and stress. Meditation enhances positive emotions and mood, and appears to make people less vulnerable to the stresses and upsets of daily life. Research shows that meditators are better at regulating immediate responses to negative stimuli and have reduced activity in the amygdala – a region implicated in response to threat. These findings reflect greater emotional resilience among meditators as well as less psychological distress and anxiety."